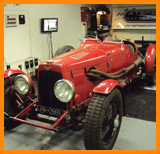 Atspeed was started back in the early 80s by company director Alan Thorndyke. Predominantly short circuit oval racing based, Atspeed quickly became a big name in the world of National Hot Rods and other high performance oval racing formulas, with a great expertise on suspension geometry and set-up, race car fabrication and motorsport engines. Soon the company had grown big enough to be able to install its first rolling road by the mid 80s, a Sun Ram 11, which even today Twenty years on, is still used by many rolling road centres. Atspeed soon became the number one place in the south east of England for carburettor tuning, and work varied from all aspects of motorsport, from historics to touring cars, and Alan is considered by many professional engine builders as "the God of carburettors" and is a recognised Weber calibration engineer. With vast and varied knowledge of motorsport engineering and mechanics in all forms, Atspeed were regularily chosen to assist at various motorsport events, including the Spa-Franchorchamps 24 Hour race for the Honda race team. Twenty years later Atspeed moved to their current premises, and with that came new changes, including their state of the art Clayton 1000BHP rolling road and dyno cell, with computer controlled software. With the new breed of technology in the car world came Alans two sons, Ian and Colin. Ian has worked for main dealers including, BMW and Honda, and also worked on the engine dynos at Advanced Engine Research, heavily involved with projects in high end motorsport such at the american Le Mans Series. Colin is our resident engine mapper, and is well recognised and respected by other professional tuners and suppliers includng Omex, and MBE / SBD. With young blood in the company Atspeed soon became heavily involved in modern day electronics, mappable fuel injection, and turbocharger systems, and of course experience handed down from the previous generation. With over 40 years combined motorsort experience between them from such a vast and varied background, Atspeed are often chosen for technical input to magazine tehnical articles, race series, and product development with mappable engine management systems, and carburettor conversions, Atspeed are able to take on almost any job, and work to nothing but extreme high standards.